January 28, 2011  In a country with millions of orphans and widows, officials say it's tough to make women who are seen as criminals a priority, which means they're basically ignored by everyone. January 21, 2011  Suicide bombers struck police recruits in two Iraqi cities this week. And roadside bombs exploded amid pilgrims heading to the holy city of Kerbala south of the capital Baghdad. January 14, 2011  Sunnis eat the Sadia brand; Shiites prefer Khafeel. Both brands come from Brazil and are certified halal. Sectarianism in the country is no longer about violence — it's about identity. January 11, 2011  The sectarian war forced hundreds of thousands of Baghdad families to flee, and turned the city into a collection of enclaves where Shiites live with Shiites and Sunnis live with Sunnis. Now hope is diminishing for many displaced families who want to move back to their old neighborhoods or sell their properties and resettle for good. January 9, 2011  Muqtada al-Sadr offered a brief speech to followers Saturday, following his return to Iraq from Iran, where he had lived in a self-imposed exile. 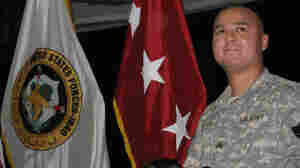 He told thousands of supporters U.S. troops need to be gone by 2012. 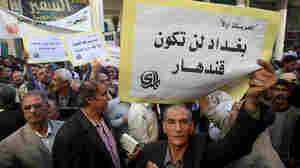 The fiery cleric also said support for the current government could continue, provided it addresses basic needs. January 6, 2011  Muqtada al-Sadr, the leader of a radical anti-American Shiite sect in Iraq, has returned home after nearly four years in exile. Sadr loyalists clashed repeatedly with U.S. forces and were thought to be behind much of the sectarian violence. 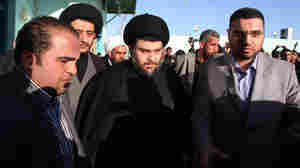 Now, Sadr says his role in Iraq is political, not violent. January 4, 2011  Starting his second term, Iraqi Prime Minister Nouri al-Maliki is talking tough on the final withdrawal of American troops, scheduled for the end of 2011. That development might force plans to be redrawn -- many had assumed that the withdrawal would be renegotiated. January 3, 2011  Young Iraqis differ from their parents in attitudes on politics, religion and even Saddam Hussein. These are the preliminary findings of a new survey of Iraqi youth, a generation born during a brutal dictatorship that experienced a U.S. invasion and witnessed violent religious extremism. December 25, 2010  More than 140,000 U.S. servicemen and women are deployed in Afghanistan and Iraq this holiday season. They are serving their country, but are away from spouses, children, and parents. This can make the holidays lonely for the families at home who love and worry about them. December 24, 2010  This is the eighth Christmas that American troops have spent in Iraq. 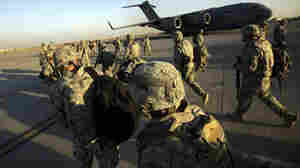 And they've got one more to go, should the U.S. stay true to its promise to withdraw all troops by the end of next year. NPR's Kelly McEvers paid a visit to troops of the 1st Infantry Division in northern Iraq to see what the war sounds like this Christmas. December 23, 2010  NPR's Audie Cornish speaks with the Guardian's Iraq correspondent, Martin Chulov, about the fate of the Quran written in Saddam's blood, as the new Iraqi government comes to terms with the relics of the former leader. December 21, 2010  The Iraqi parliament has approved the new government of Prime Minister Nouri al-Maliki. But Maliki is still negotiating to fill some key posts, including the Defense and Interior ministries.